In The Elder Scrolls Online: Morrowind, Zenimax plays its Vvards right. A great repository of nostalgia-heavy stories, but it doesn’t make the most of being an MMO. What is it: The next chapter in the Elder Scrolls MMO and a return to TES:III's iconic titular landscape. MMOs can’t thrive in mediocrity. In order for a game in this genre to please a consistent or growing player base of the size necessary to keep an MMO world ticking over, there needs to be something about it that’s both different and brilliant. Upon first launch three years ago, The Elder Scrolls Online did not have this essential ingredient. It felt too much like an MMO by-the-numbers and its splash of Tamriel flavouring was not quite enough to set it apart. Since then it’s been added to, revamped and revitalised, with One Tamriel, which opened up the world via a level scaling system, and Zenimax Online’s forays into more flavoursome RPG storytelling with its Orsinium DLC (among others). 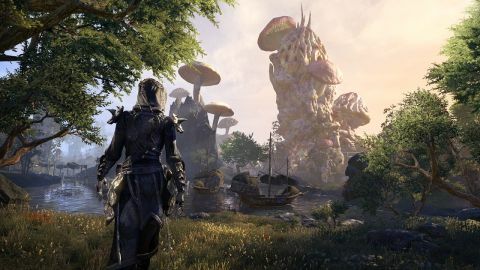 Morrowind, ESO’s first additional ‘Chapter’ (the developer is weirdly reluctant to use the word ‘expansion’), is a fresh mark in the sand for the game, a point from which fans will be able to say it really found its place in the wider pantheon of MMOs. And that place is as a teller of great stories. I’m fairly late into a particularly long session of playing when the effectiveness of ESO’s new storytelling potential hits me. I have spent the better part of two hours in Sadrith Mora, entangled in the plight of Sun-in-Shadow, an Argonian slave with untapped magical abilities and an enthusiasm for the local mage community’s propensity for political intrigue. As I jog about the town, chatting to other wizards and councilors on her behalf, smoothing her possible path to a higher rank, little nuggets of exposition are expertly planted all adding extra spice to proceedings. There’s Eoki, a love-spurned fellow slave waiting for his one-time partner to free him. There’s a deep seeded racism in the council chamber, with one character in particular seeming to hold a meaty grudge against Sun-in-Shadow’s lizard-folk. And then there’s Sunny herself. Each time I return to her to hand in a quest I find myself combing her dialogue to find hints of her true motives, buffeted as I am in this beautifully overgrown collection of fungal towers between viciously ambitious mages all out to get their own way. Each time I’m handed a quest which requires a brisk stomp across the open map I find myself setting out again, despite the late hour, not because I want to get the promised loot at the end of the trail, and not to tick off an objective in my journal. Instead I keep going into the early hours because I just really need to see how this all plays out. There are stories involving magicians with cat allergies, or Nords having their pants stolen while drunkenly running away from goblins. Part of the reason the stories in Morrowind are so moreish is that they are not of the typically fusty sort you might expect from a high fantasy setting. There are stories involving magicians with cat allergies, or Nords having their pants stolen while drunkenly running away from goblins, or literal cowl-wearing vigilantes in need of aid as they bid for local justice (that last one comes complete with ESO’s equivalent of a Commissioner Gordon). These tales are great, threaded, winding and frequently unpredictable. They’re often funny, too. One such tale sees me chase after a bumbling archeologist dark elf at the behest of his fawning downtrodden assistant, Elfbetta. You really do get a sense that the writers are having an outrageous amount of fun, despite being under pressure to offer fans a location that delivers on 15 year-old treasured memories of their first excursion to Vvardenfell in The Elder Scrolls III. It’s very easy to find yourself gasping, laughing and generally going along for the ride with them. The setting plays a huge part in that. Stepping off the boat at the start of the chapter in Seyda Neen in full high texture quality, contemporary-o-vision is a powerful thing for those that were there 15 years ago. And the whole map is full of moments like this, from the half-built cantons of Vivec City (ESO’s Vvardenfell is chronologically set 700 years prior to Morrowind), to the ever-present lurking of the volcanic Red Mountain at the island’s centre. There are constant nods sprinkled throughout the game for veterans to enjoy, and, importantly, these don't feel like obligated fan service. The team re-building this world clearly harbours a love for the original. And it’s easy to see why. For those that weren’t there all those moons ago, Vvardenfell is an exceptional backdrop for a fantasy game. It’s an almost alien landscape, where looming mushrooms tower overhead and biomes shift from dense foliage to ash-choked badlands. This is mirrored in the soundscape as well. There are refrains that will instantly trigger your memory, such as the rousing main theme, but there are incidental sounds which layer atop your otherwise sedate exploration, further fleshing out the world. The low groan of a silt strider. The chirping of a chitinous bug. This is not a typical fantasy land and, despite the inherent nostalgia, it feels as fresh now as it did back then. What doesn’t feel that fresh at all is the game’s combat. This is an area that has had only minor improvements over the last three years. It's still clunky, preoccupied with left and right mouse clicks in time with over-egged animations and stun markers. The new player class, the Warden, is perhaps a telling indicator of how uninspiring the existing classes are to pick from and why they are so hard to even remember beyond the character creation screen. The Warden is capable of performing in DPS, healing and tank roles, and boasts an ultimate ability which sees a persistent bear guardian follow you around to aid in combat. It can do everything well, basically, and picking anything other than Warden when starting the game afresh now feels like the wrong thing to do. That’s great if you’re just starting out, but for those already wondering why they bothered picking Nightblade three years ago, the itch to just start over and get yourself a friggin’ bear will likely be high. I can't help but wonder (and I do this whenever I ponder the class system of an MMO I happen to be dipping into) why more games in this genre don't look towards FFXIV’s excellent class system, which simply lets your one main character be whatever you want it to be, whenever you want it to be. In ESO, and its new Morrowind excursion especially, I ache for the freedom of character development proffered up by the game’s mainline inspirations. One thing that is great about the Warden—again, to the detriment of the other classes—is that it is a very readable class. With all characters capable of wearing any armour sets, it can be hard in a pinch to clock what role any given player character is supposed to fill. Is that fully plated cat-person over there a tank or a healer? With the Warden, well, she’s got a bloody bear next to her for a start. Each ability performed is also given a telltale series of persistent animations. A load of mushrooms sprouting at that Warden’s feet? Then she’s a healer. Covered in ice? Then she’s a tank. It’s a shame that the old classes remain comparatively unmemorable or unreadable. Given the quality of the storytelling in the main event and the fact it can all be tackled solo, it does beg the question: why make this an MMO at all? In Morrowind, there are not too many explicit excuses to partner up. In fact, in terms of PvE, there’s a new 12 player Trial (ESO’s version of a raid) and that’s about it. The Halls of Fabrication Trial suffers from the same problems that the game’s existing Trials do, and that is that there’s little incentive to get that involved. Given the quality of the storytelling in the main event and the fact it can all be tackled solo, it does beg the question: why make this an MMO at all? In ESO, as I mentioned above, the thing that keeps you pushing on is that you want to find out what happens next, not what loot will drop at the end. As such you may want to pal up and complete a Trial, but will it become your go-to endgame runner? I doubt it. It’s weird to suggest this, but unless you're into PvP, and the game's robust new Battlegrounds maps, then this iteration of Morrowind feels like an MMO only because of circumstance, not design. Those Battlegrounds are really well put together for those that are inclined, however. The stages themselves are full of vertical spaces and open killing grounds, tight corners to get the drop on foes and other such neat touches. The new format of 4v4v4 is also a neat addition, as it requires coordination to consistently succeed, but leaves enough breathing room for unsteady alliances and fun match-based emergent stories. Ultimately joining in with PvP involves the same sticky combat system, and it’s not enough to sustain you into the hundreds of hours. On the hunt for a new game to power through to the endgame of with a bunch of guild mates? ESO: Morrowind, despite being hugely improved from the base game, still isn't going to scratch that itch. But this new chapter is one of the most encompassing and charming repositories for great stories I’ve played in a long time. Morrowind is an essential excursion for those of a certain gaming vintage, loaded as it is with reverence for that 15 year-old adventure. It’s also an ideal way for those unfamiliar with the original Morrowind to discover this enrapturing landmass for the first time. Just don’t feel like you need to invite all of your friends along for the trip.